Made by Williams in June, 1966. This is a four-player machine. Its artwork is the sharp-angled style popular during the late 60s and early 70s. 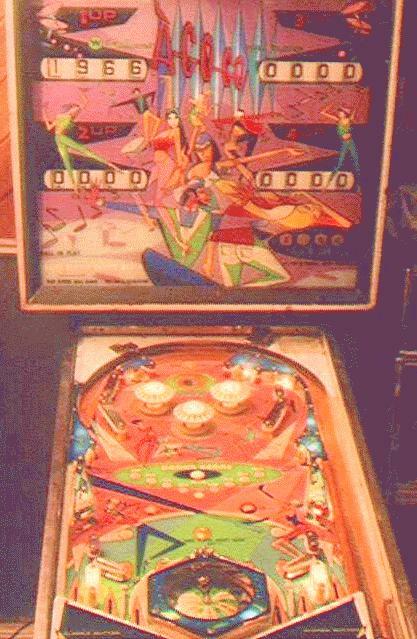 A good photo of the backglass is in the book Pinball Machines by Eiden. Backglass: shows go-go dancers and geometric shapes. 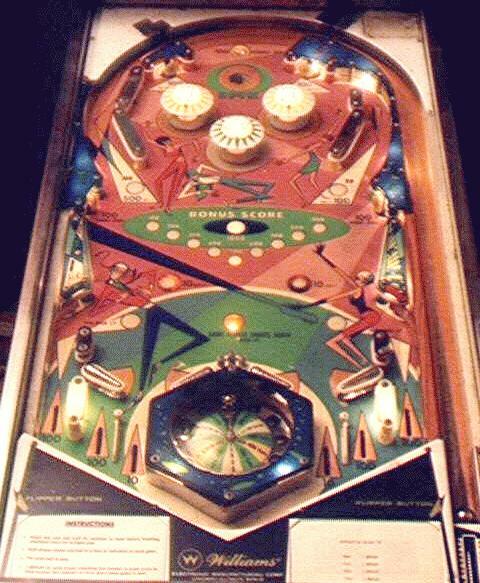 Playfield: Mostly symmetrical layout with a roulette wheel in the lower center portion of the playfield. The flipper layout is similar to some other games with a roulette wheel--Suspense, Williams 1969, and Super Score, Gottlieb 1967. The roulette wheel is centered just above the outhole. Two 2" metal flippers are on each side of the playfield at the top of the wheel. This arrangement looks something like the diagram below. Cabinet: Colors are light blue and dark blue on a white background. The stenciled shapes are geometric designs. The shape of the cabinet is unusual in that the front foot or so of the cabinet is cut lower by about 5 inches than the rest of the cabinet. The front legs are shorter because of this, but the height and pitch of the machine are normal. Slight variations of the cabinet design was done on just a few machines, most of which are in the 50s and 60s. This machine has the charm of an older machine, plus the excitement of a roulette wheel. I really like the artwork and the look of the playfield. For years of collecting machines, I couldn't seem to find a decent machine any older than 1967. Finally I found one. A-Go-Go is now my oldest flipper pinball machine in my collection. This machine was mostly working when I got it and I haven't had to do much to it. The backglass is in excellent condition and overall I am very pleased with this machine.